We have several related problems with electricity. We are using more and more. Electric cars, buses and trucks will mean, that we’ll use even more. A lot of electricity will be produced in the wrong place and at the wrong time. Not everybody uses the same local voltages as our 250 VAC. We need ways of storing electricity. Some methods of generating electricity, emit a large amount of green-house gases. In the UK, we have a very sophisticated energy grid, which includes a certain amount of energy storage, that moves energy around from where it is generated to where it is needed. As an example, I’m sure we’ll see industries that need a lot of electricity, taking advantage of wind energy generated at night. In my lifetime, I can only remember two periods of severe power shortages. In the 1950s, as people bought more electrical equipment like fridges, cookers, kettles and TVs, there was sometimes power cuts at Christmas. In theb1970s, shortages were caused by industrial action. But in recent decades the National Grid has generally kept the electricity flowing. Most power cuts have been local equipment failure or weather-related. As the future unfolds, the grid will get better and of a higher capacity to handle all the extra needs of our lifestyle. Countries, states, towns and cities will develop their own sophisticated networks to look after their people, industry and transport. These smaller networks are now increasingly being connected together to create larger networks. One of the first interconnectors was the HVDC Cross-Channel between England and France. Wikipedia gives this history. The first Cross-Channel link was a 160 MW link completed in 1961 and decommissioned in 1984, while the second was a 2000 MW link completed in 1986. The current 2000 MW link, like the original link, is bi-directional and France and Britain can import/export depending upon market demands. I’ve read that in recent years, we’ve been using French nuclear power and they’ve been using our wind power. According to this page on UtilityWise, there are. Four operational interconnectors are operational. Four interconnectors are being constructed. Seven interconnectors are being planned. They also have this diagrammatic map. 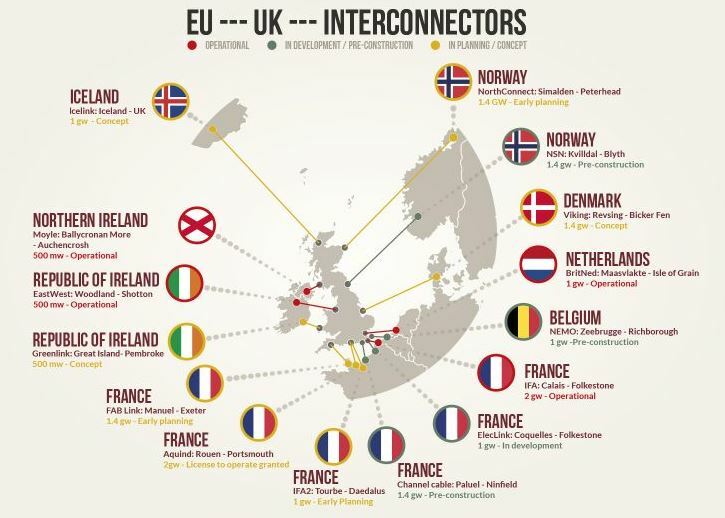 If the Icelandic interconnector gets built, it could be a big source of zero-carbon power for the UK and Europe and a large income for Iceland. Two big interconnectors to Norway are planned, where there is lots of hydro-electric power. A big interconnector is being built between Germany and Norway, which is not shown. There will be seven links to France to tap into their nuclear network. Our contribution to Western Europe’s power will be mainly from our extensive wind farms, which will soon contribute twenty percent of our power needs. It will all grow like a gigantic spider’s web, connecting excess power in one place to users, who need it, in another. This document on the International Energy Agency web site, gives a lot more information about Large Scale Electricity Interconnection. Terminal costs at the end of a link are more expensive. The cost of the cable is less per kilometre. Longer interconnectors have a cheaper cost per kilometre over about 600-800 km. Current technologies give a break-even distance of about 600-800 km. The article says this about future projects. With the increase in demand for long-distance interconnection, a number of projects have been envisioned that would greatly improve upon the current status. Projects in the pipeline include the undersea North Sea Network (NSN) link between the Nordic zone and the United Kingdom, which will deliver up to 1.4 GW of power through an undersea cable 730 km in length. This entry in Wikipedia gives more details on the Norway-UK Interconnector. When AC systems are to be connected, they must be synchronised. This means that they should operate at the same voltage and frequency, which can be difficult to achieve. Since HVDC is asynchronous it can adapt to any rated voltage and frequency it receives. Hence, HVDC is used to connect large AC systems in many parts of the world. This may seem technical, but it is important. As the voltage in the interconnector increases, it makes it more economic to connect remote energy resources to where the power is needed. It gives these examples from around the world. Solar power in the Rajasthan desert in India. In the Uk, we ae developing two long interconnectors to Norway and one to Iceland. Variable renewable energy (VRE) deployment requires flexible transmission links. One of the key drivers behind HVDC lines and interconnectors is the ability to shift intermittent renewables to areas of high demand when conditions would otherwise lead to curtailment. Hopefully, the wind will be blowing somewhere, when the sun isn’t shining somewhere else. Interconnectors will become a massive part of our distributed electricity system. I must also say something about energy storage. Electric vehicles could eventually turn out to be a large part of our mechanism to store excess energy. Suppose there is excess energy at night, perhaps from wind, waves and tides and it is used to charge the batteries of electric vehicles. It has not gone to waste and is now stored for use when required. The corollary of this will be, that every parking space or garage, where vehicles are left overnight will have to have a charging point for an electric car.